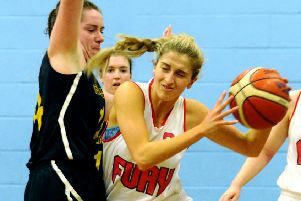 An improved defensive performance was what Fury had been looking for and that’s what they got as they scored 70 and held Glasgow University to a mere 42 points – the lowest score by any team this season in the Championship. A tight home game earlier in the season – a six point win for Fury, meant this could have been a problem fixture for the Falkirk side. Leading 14-13 at the end of the first period, Fury upped a gear in the second with an 18-7 quarter, to lead by 12 at the half. 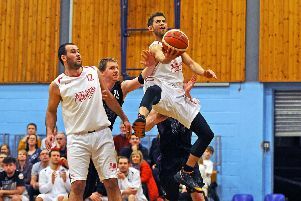 Bulgarian Boris Matrakov led Fury with 10 points at the half and the rest of the scoring was spread across the team. The Sony sponsored side continued to play well defensively, holding the student side to 11 points in both the third and fourth periods, while posting 18 and 20 points themselves for a comfortable win. The second half had seen Fury again play solid team basketball with the scoring again spread across a number of players. Scottish centre Ross Gibson continued his good form at both ends of the floor and guards Bantu Burroughs, Eddy Leginus and Bryan Munnoch did a solid job against the University playmakers. The win keeps Fury top of the Scottish Division 1 table and, with rivals Edinburgh Kings and St.Mirren both suffering losses, the chance of the Falkirk side taking runners-up spot for the season improved significantly. Reign, with three games in hand over Fury, sit two points behind in the table and look likely to take the Championship. For Fury, Bantu Burroughs top scored with 16 points with Matrakov on 12. Fury head coach John Bunyan told the Falkirk Herald after the game: “This was our best defensive performance of the season against a team who have a lot of firepower. “With no game this weekend before our cup final against St.Mirren on the second, our focus in training will be to be ready for what will be an up tempo game.